Thinking of joining the Evergreen Parenting Team? Is your family Evergreen? Would you like more information regarding being trained to become a facilitator? Steps to become a facilitator? This experience will help you prepare for the training, as well as give both you and us a better understanding of your specific temperament and character traits. The fee is included in the total fee for the training. It is recommended that you attend an Evergreen parenting course as a 'parent' and not as a 'potential facilitator', before completing the facilitator training. We need to receive a CV from your pastor / minister where he testifies of your active involvement in the congregation and your involvement in a small group / cell group / community group. Send your referral to your specific training coordinator. 5. Complete the training through one of our training options. Select from Group or Online. As you read this document setting out our “Facilitator Requirements” we appeal to you to please give prayerful and serious consideration to the heart of the content and if you can identify and align with it and earnestly desire to team up with us, we would like to hear from you. What else do we offer you once you have been trained and accredited? During the training you will be equipped to present the Evergreen Parenting course and to deal with parenting concerns, tough questions and challenging parents! 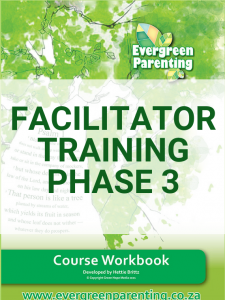 After successfully completing the accreditation criteria , you will receive your accreditation certificate, which qualifies you to facilitate your first Evergreen Parenting Course! This training course is not only about the content and information. We want to make a lifetime investment in every attendant in the hope that you in turn will invest in all the lives that you have the privilege to impact on. We have no doubt that the invaluable training you receive will not only enhance you as a person but enrich and empower your family life, career and relationships. You will receive a certificate qualifying you as a facilitator to use the Evergreen Parenting DVD series for training. You will also be entitled to order an ever-expanding range of Evergreen Parenting products such as course material from the Evergreen Parenting DVD’s, CD’s and books, various discipline tools and other items of value, to sell at a fair profit at your seminars in order to add value to your business. Only those who have successfully qualified will be entitled to present the Evergreen Parenting Course. You will enjoy ongoing support – OUR HEART IS TO SERVE AND ENRICH! As we keep on learning and become aware of training opportunities, new products or publications, relevant legal issues etc. we’ll keep you informed. You will share in the whole Evergreen Support Network. You will enjoy access to advertising material at cost price for the promotion and marketing of your talks and presentations. What are your commitments and responsibilities to Evergreen Parenting? The DVD series will be subject to a “Usage Agreement” and remains the property of Evergreen Parenting and shall be returned in good order should you as the facilitator decide to cease doing presentations or not adhere to the Usage Agreement. You will therefore be responsible for the proper care and return thereof in such event. Evergreen Parenting will maintain the right to reclaim the DVD series, should you be found in violation of the Usage Agreement, by, for instance, using the DVD’s for shortened versions of the course or by not ordering workbooks for all the attendees. The DVD series shall be used solely for viewing by persons attending one of the official Evergreen Parenting Courses. It shall further be used in its entirety and not only shown in part. In order to maintain a meaningful assessment Data Base for Evergreen Parenting, each Facilitator will be required to provide Evergreen with a list of attendees for each and every talk and presentation of whatever nature. Evergreen Parenting will have the right to send feedback questionnaires to these attendees in order to fine tune the product and training to meet the ongoing, varied and changing needs of the communities we are called to serve. In return for the feedback questionnaires that attendees complete, we aim to continually serve and support them with valuable and encouraging material which will help them on their journey. Do you pay Franchise Fees? No, you will not be paying any Franchise Fees!! DISTRIBUTION OF FEES FOR COURSES PRESENTED BY YOU PERSONALLY? The full fee will be yours. All you owe us is to buy a workbook for each attendant, as well as your commitment to give your very best!! What will we require of you? 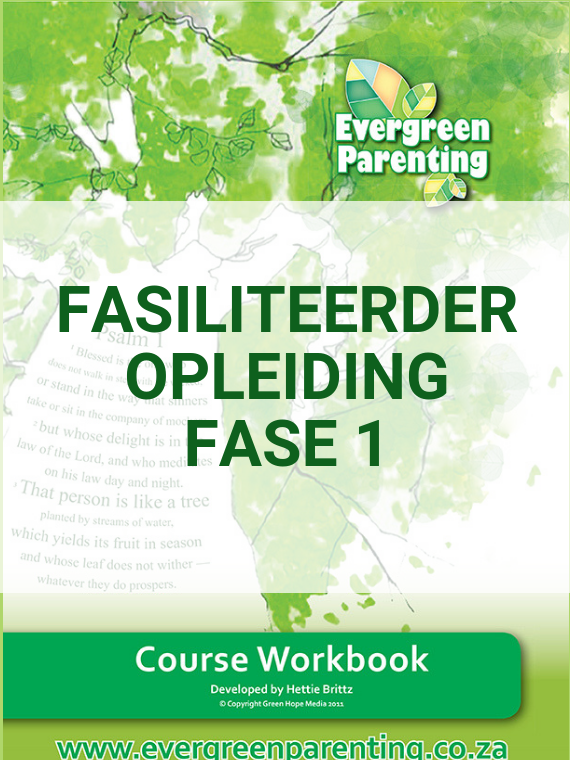 To undertake that you will purchase all Evergreen Workbooks and Evergreen Course Material produced by Evergreen Parenting directly from us and that you will under no circumstances make or allow others to make any copies of these Workbooks or other resources. To refrain from presenting any course in the name of Evergreen Parenting without the appropriate and prescribed material. To refrain from using the material for any purpose besides the presentation of the entire course to parents and/or educators. To respect this fully in the light of our being able to maintain a uniform and acceptable high standard at all times. The purchasing of workbooks and parenting resources will be our only source of income to enable us to develop, produce and make available new and updated quality material and to cover our running costs as well as the initial cost of the DVD series. To refrain from making any changes to the Evergreen Workbooks or Evergreen Course Material without deliberating with the Training Team. This is to protect the integrity and uniformity of the product. Your recommendations and suggested changes might be of value to other facilitators. Any input from facilitators, which will improve, add value to and further enhance our community at large will be considered with open minds and implemented where applicable. The complete accreditation fee is R6000. The fee includes all training material, a workbook with family chart, parenting profile and stickers, a set of temperament cards, the accreditation process, certain products, a DVD set, website set-up and administration. Group Training - On Hold Currently! Sodra ons al jou verwysings bevestig het, sal ons vir jou 'n wagwoord stuur waarmee jy hierdie pakket kan aankoop. Dankie vir jou geduld en deelname in hierdie proses. You will only be able to buy this training sessions if you received a password via email. An email will be sent to you as soon as the training team has verified your references. We thank you for your patience in this regard.